Sorry, about the video clip. I couldn't see that it was upside down before it was posted and I don't know how to fix it. Yikes! My day started out on a good note because I got up feeling a little better. I was able to sleep with my CPAP last night for the first time in almost a week, which means I got more and better sleep than I have been. I still have a little cough and some scratchiness in my throat, but, overall, I'm feeling much better. I ate a healthy breakfast (a strawberry banana smoothie and a hard boiled egg) and headed out the door for an appointment with my "counselor". I have some things to work through related to my Mother's death last fall and some sibling issues. The appointment went well. Next up, a 3-mile walk around my neighborhood that took me almost exactly 1 hour to finish. Now that, right there, was a triumph for me, because that Spring weather we had last week? It's GONE! I really didn't want to be out there in the wind and cold, but I did it. So, I'm counting my walk as a major win! Woot! Next up, lunch. I went out to eat and actually ordered myself a bowl of chicken soup and a boca burger with lettuce and tomato. I had some cheddar cheese melted on it, but no bun or mayo. Also, no fries. I gave up soda years ago, so I didn't waste any calories there either. 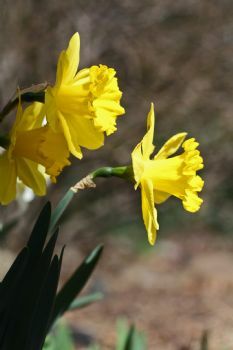 On my way home, I spotted some daffodils blooming in my neighbor's yard. Perfect! I've been wanting to resume my photography hobby and those flowers were my opportunity! I grabbed my camera, walked down the block, and climbed down on the ground to get this shot. How's that for inspiration? Everybody, think SPRING!!! Back at home, I settled in for some nice one-on-one time with my girl, Melody. I practiced my scales and some chords. Worked on a few songs I haven't played in awhile. Rearranged some chording in another song, which I didn't think I was "advanced" enough to do on my own (but it worked out). Before I knew it, Melody and I'd passed 2 happy and peaceful hours together. Talk about therapy! The video clip is a piece of my practice today. As an aside, while I was playing, I noticed I was racking up the steps on my Fitbit. Just for some giggles, I looked up calorie burn for playing piano. One website said I'd burned almost 400 calories playing for 2 hours. But I don't believe it. I finished the day with a healthy and filling dinner, made by my friend, DoItDottie. We had a salad and a crab and penne casserole with little tomatoes and peas in it. Delish! Dinner came in at under 500 calories and I'm on the very bottom of my range for the day. Enjoyed the music even if you were upside down. I know it's a silly question, but how do you put the video up? Is it with a Smartphone only ? I imagine it can't be done with an ipad. Thanks in advance for your reply. Good for you. Nice sounds. Have a great day!! Round of applause. I loved that! Enjoyed listening to you play the piano - very nice - and glad you're feeling better!!! Sounds like a fantastic day! Lots of good choices and great activity! Well done! Loved the piano music you shared and the daffodils were so nice to see!! You are doing so well!! Look at yourself with eyes of love. Love all that your body and mind can do. You've decided to make some changes and you are working hard to make them happen. Your winter walk was an absolute win! Good for you. You are one day closer, one walk closer to living peacefully, happily, healthily in your skin. You chose to bring it one day closer.....good for you! Sounds like a lovely day. May you have peace. You play beautifully upside down. :) I avoid mirrors and pictures still because I see myself and don't like it, and my 'mind' doesn't see myself that way. However, the fact that my mind doesn't see myself that way is also part of the reason it took so long to do anything about my problem. LOL On the upside, it gets better.